As I go deeper in the mind I find it increasingly hard to talk about. For instance, writing about remote viewing is odd enough, let alone what it actually implies for our reality. It’s easy to dismiss what we don’t understand, and just allowing yourself to think there might be something to remote viewing opens the door to how on earth it could be possible. If we are able to access information from the so-called future and pass it back to ourselves today, then what does this say about our reality? That’s the problem on topics of the mind. When you open the door, the whole damn tide floods in. When you get into meditation you learn that our awareness extends beyond the meat and two veg. With meditation you can easily explore consciousness by getting your feet a little wet, but sometimes you’re forced to dive all the way in. That’s what happened to Harvard neuroanatomist Jill Bolte Taylor when the left hemisphere of her brain blew out and she got flushed through the other door. I write about her all the time because in her TED Talk she provides a rapid glimpse into what enlightened humans describe as the true nature of reality. To the left hemisphere of the brain the world is solid and rational, yet to the right it’s an energy soup. Elon Musk apparently thinks the chances are 1 in billions that we aren’t in a simulation. I like where he’s coming from, but I’m not so confident that us humans can even comprehend let alone describe what this reality is. Like trying to explain to my cat where I’m going for lunch, or even what is outside our home in New York, some things aren’t possible for us animals to understand. We are barely a rung below the monkeys swinging from the trees, our conscious faculties are built to operate in a linear, time-based reality, and you literally must be out of “that mind” to experience reality differently. Buddhists. Catholics. Muslims. Jews. Greeks. Egyptians. Indians. Conspiracy. Ancients. Hermetics. Philosophers. Trippers. Transcendentalists. Most lately, Science. Like the Catholic Heaven and Soul, they all describe some form of reality beyond WYSIWYG. Where I wholeheartedly agree with Musk’s quote is thinking of reality probabilistically. If so many different schools of thinking can have conflicting views on reality then unless they’re all wrong, there’s a decent probability there’s something to it. Whether it’s the eastern Absolute Reality, the Catholic Heaven, the Mason’s Great Architect or whatever those Egyptians were doing inside their pyramids, us humans have always described a reality beyond the one that meets the eye. There’s some probability that we are barely conscious monkeys trying to rationalize our existence, but I’ve discovered plenty of evidence to suggest there’s something more. And, even if there is only a tiny probability that there’s something beyond this matrix, the tiny probability is SO MAGICAL that I have committed my life to exploring it. Why these topics are so hard to talk about. I used to think of the mind as stuff like positive thinking. Then it became about hard-core programming. Today I see it as the doorway to the unknown. I’m not sure that we can know what this reality is, but I do know it is PURE MAGIC. 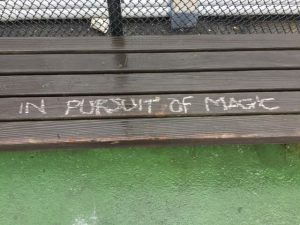 And I believe it is magic we are here to pursue!